This article will be useful if you need to consume ASP.NET webservices from languages or platforms without .NET support. In this example, I am consuming awebservice from a Java applet, but it would take very little work to adapt my code to run as a Java application. Although I have only tested this on Windows XP, the code should run on other platforms, providing cross-platform client-side consumption of ASP.NET webservices. This article shows you how to use a Java applet in your webpage and get it to communicate back to ASP.NET by consuming an XML webservice on the client. Therefore, I decided to try writing my client-side code in Java 1.1. Note that I'm using the Java 1.1 SDK, as Internet Explorer currently does not support code developed with Java SDKs after 1.1.4 (although it seems to me that Java SDK 1.1.7 code seems to work OK in IE). A Java applet can do all of the image manipulation I needed and is supported by many browsers. Finally, I don't have to write separate code for each browser. The next problem was, how do I get the result of the data processing done in theJava applet back into my ASP.NET application? 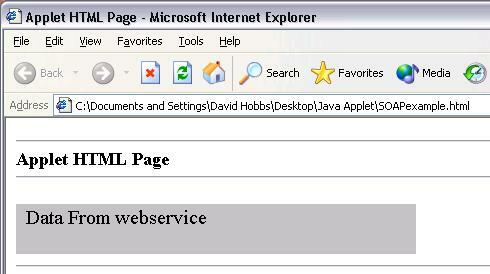 The answer that I came up with was to create an ASP.NET webservice and consume it in the Java applet. In this example, the response string is filled with the result from the webserviceafter we sent it two parameters. The full source code of the SoapRequestBuilderclass is included in the source files. That's it! It's only a very simple example and at the moment, I'm only interested in returning a single value back from the webservice, but I have used something similar with a webservice that talks to my back-end database and this allows myJava applet to store data which can then be accessed by the ASP.NET pages. To run the example code, set up the webservice first, then copy the Java applet files to any folder on the same machine and double-click the HTML file. All of the parameters are configured inside the HTML file, so you can change the values passed to the webservice by editing the HTML; you should not have to re-compile the Java source. I have tested the example in IE 6.0, Netscape 7.1 and Opera 7.23 on Windows XP. Some Java Virtual Machines (like the Microsoft one) only allow you to make a socket connection to the same machine that hosts the Java class files. Therefore, if you're using an applet like me, you will need to host the Java class files on the same machine where the webservice resides.